So, you’ve got some cash, and you want to invest it in something other than a bank account. Understandable, considering the interest rate these days on moola in the bank amounts to diddly squat. So, what do you do with it. Well, the answer to that question depends on how much cash you have. First and foremost though, the answer hinges on whether you need access to your money. This easy-to-understand chart presents you with several options depending on how quickly you need to be able to withdraw money from the account. If you need to be able to take out cash on a weekly or monthly basis, then stick with a savings account to avoid fees. If you want to earn a little bit of money and don’t have a problem with keeping your money locked away for a year, then pick a one year CD. Now, in my opinion, this is the absolute worst option no matter what your financial situation is because interest rates are incredibly low at the moment. The money you will make cannot justify you putting it in a CD for a single year. I would personally always aim to put cash into a CD that lasts for two years or longer. If you can afford to put cash in a 1-year CD, then odds are that you can probably afford a 2-year CD as well, and that’s a better option. But that’s just my opinion, and I’m not a financial adviser. I’m just some guy writing this post with an opinion. Now, if you have over $250,000 to invest, then you have some options. The reality, of course, is that if you have that much money to invest then you have way more options than CDs or bonds, but that goes beyond the scope of this graphic. 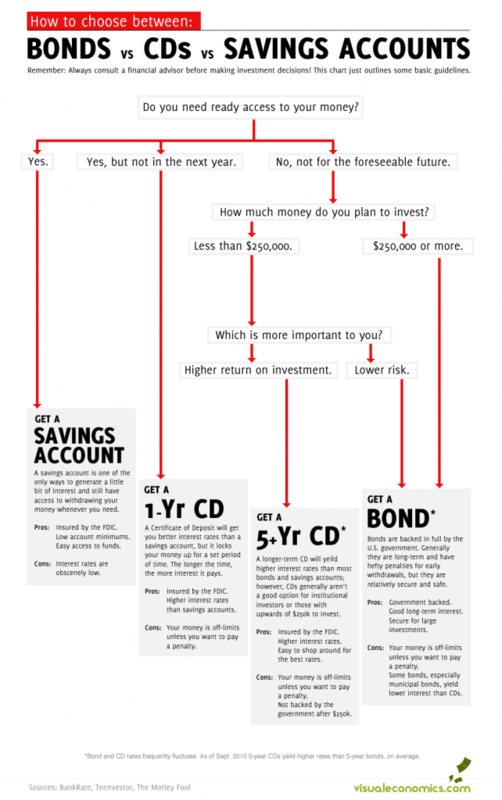 The graphic points out that a five year CD is actually a ridiculous option (it doesn’t use those words, but implies that) if you have $250,000 to invest and are presumably at an age where you can risk that kind of money. Interest rates are horrible, and if you have that much money to risk, you are much better off putting it in the stock market, in real estate, in a hedge fund, in a business venture etc. etc. Of course, you can only invest in a hedge fund or say, as a limited partner in a venture capital or private equity firm if you’re an accredited investor, but odds are that if you have $250,000 to play with, then you probably are a sophisticated, accredited investor. And in this case, the idea of putting $250,000 in a non-FDIC insured account that can only earn about 2.5% interest over five years wouldn’t even cross your mind. Seriously, think about it. Tie $250,000 up for five years to earn a measly $6,250 (with no guarantee that you’ll even earn it). No thanks. Alright, roll over Beethoven; there’s a whole lotta grading goin’ on. (Never again will I write that–don’t worry). Is a B- too kind? 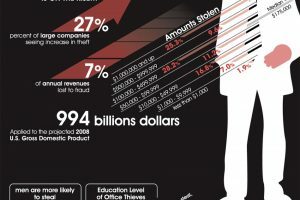 This graphic is intentionally minimalistic, and on this blog, that approach is rarely rewarded unless the minimalistic design is extremely unique in some way. The graphic’s design does make the concept easy to comprehend, so I suppose it deserves some points for that. Again, too generous? There isn’t much there, there–as Richard Dreyfuss would say. No quirky facts or unusual insights–the kind of things we’ve grown accustom to here at the infographic showcase. I think this graphic is functional, but I don’t know what redeeming qualities it has beyond its narrow educational purpose.